It’s time for… Ask the Internet! Today’s question: How do you deal with orphan socks? When you do your laundry and one of a pair of socks is missing – what do you do? How long do you keep orphan socks before realizing you’ll never find its mate? Where do you store orphan socks? I used to put everyone’s socks together when I folded laundry, but that became a real chore. I’d throw socks into a special basket and plan to sort them when I was done with the laundry. 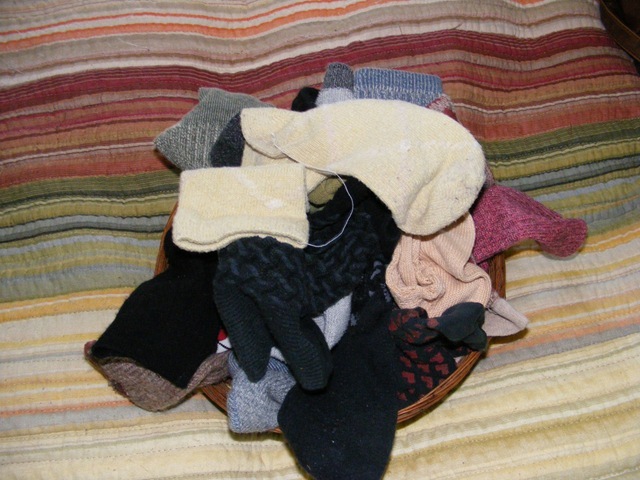 By the time I’d finished the laundry, however, I was in no mood to sort socks and the basket of unsorted socks turned into two, then three, before I finally sat down to sort them. A couple of years ago I decided to just toss the unmatched socks into the basket of the owner (each family member has a basket that I fill with clean clothes and they’re responsible for putting their own clothes away – although the kids do most of their own laundry these days). I still end up with a pile of my own orphan socks, however. It grows each week, it seems. I’m worried that as soon as I throw away one of the socks I’ll find its mate. So, I ask you – how do you deal with orphan socks? I keep them far too long. Like you, I think that I’ll find the mate as soon as I throw one out. If you come up with a solution, patent it and you’ll make a fortune. Glad I’m not alone, Mali! I have a bucket full. After a few years, I give them over to the sock puppet makers (kids). But many times the match is in the next load so I do keep a bucket (it’s an old lego container, about a gallon). What does happen to them? I mean, if you don’t go to a laundromat, the sock has to be somewhere, right? Do washers and dryers just mess with us? I remember a coffee shop somewhere in northern New York state where they had a wall of orphan socks. People were invited to post their own or take one if they could use it.